About a year and half ago, I became involved with a group of people associated with two churches in our area. The group had sponsored an Iranian refugee family and undertook to help them settle in Montreal and I was quite accidently involved as a translator. The story around the family and how it got along with the new situation did not turn quite as expected. But for me personally what came out of that experience was absolutely priceless, as it opened the door of friendship with several incredibly dedicated, kind and caring individuals – the people I would have never even met in my life under any other circumstances. Last week I got words about one of those two churches, the St. Mary’s Anglican Church, holding its second charity concert to help school children In Haiti. The context of this charity activity is that last year the Primate’s World Relief Development Fund initiated a project with the aim of collecting enough money to provide 3,250 Haitian Children with one daily meal in 15+ schools for one year. 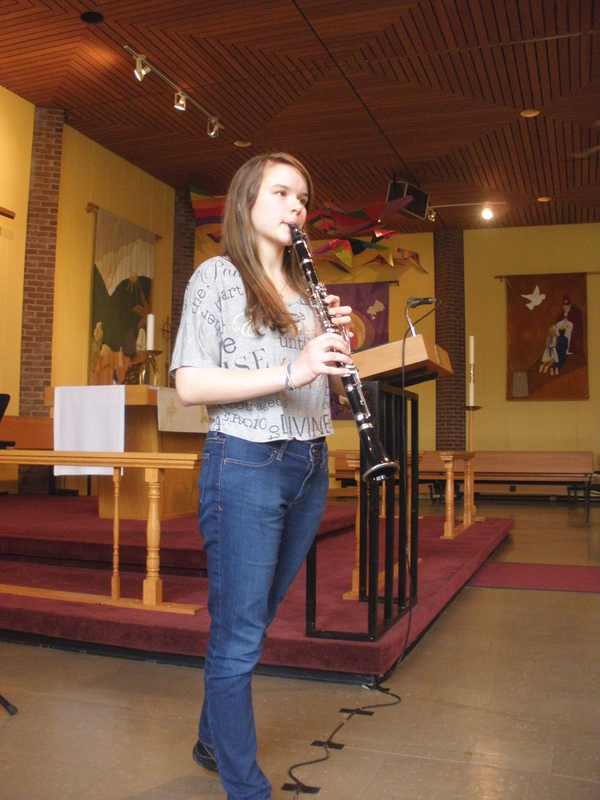 Since then, the Youth Group of St. Mary’s Church in Kirkland has been collaborating with Solid Haiti, pledging to support the cause by raising $1500.00 through charity concerts. The concert was to be held at the church on Sunday 22nd. .and tickets were sold at $10. I headed to the church, for the first time in my life, with the intention of catching up with a friend, seeing a few familiar faces, and contributing in a very small way to a great cause. Being entertained was in the back of my mind too! The last thing I was expecting was to be touched by a high quality music so empowered by passion and love that would bring tears to my eyes more than once during the course of the performance. It was indeed an electric program of jazz, Irish folk, and classical music played by a spectrum of professionals, music students and ordinary men and women of different generations. Here are a few snapshots I stole from the afternoon so that I could at least share the joy I experienced through pictures and words if not the sounds. Marie Landry (first from right) holds a degree in music and as a working mom of two also gives private piano lessons and collaborates closely with her husband, the church’s minister, in various activities pertaining to their church. 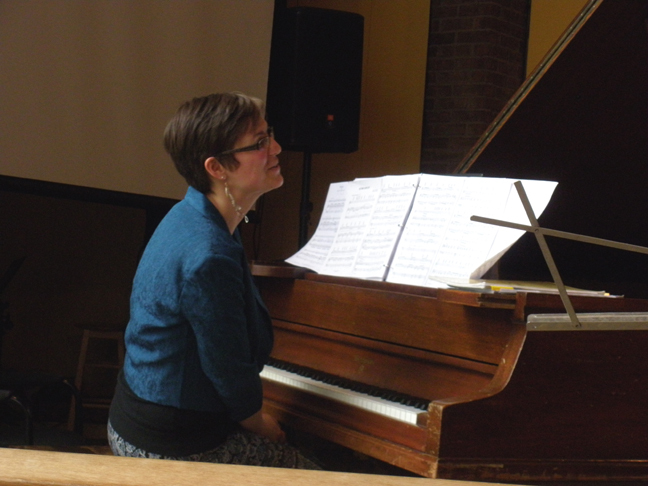 She was the one who put together the program, coordinated months of rehearsals, played solo a few pieces and accompanied most of the players and above all, narrated the whole concert: she gave little warm anecdotes in way of introduction or reconnection before each player’s performance. The couple in the picture gave a musical welcome. How often does one come close to the French horn? Not very! David Marlowe and Pamela Putnam entertained us with several duets by Corette and Shaw in addition to some folk songs. We drank them all in! Fourteen year old Jacqueline Piché played Mozart and Bassi (solo and with Marie’s piano). The round and somber sound of her clarinet, and her calm and passionate way of blowing into it with half closed eyes was so magical that I felt being under her musical spell within the first few minutes of the concert. When playing duet with youngsters (mostly her students), Marie softly struck the keys with one hand while moving the other hand over the keys with fingers slightly swaying like a swan ready to land on the water, all the while giving reassuring smiles to the other player. When playing Chopin’s Prelude, she appeared in full control with minimal body movement, yet I was sitting close enough to feel the energy and emotion which rose from her fingers and flushed her face while she struck the keys hard and echoed the music’s pain and love. The left side picture shows Rev. Lorne Tardy chatting with people during the intermission. There were other players that I was not able to take pictures of: Alice Marlowe who played two piano pieces by Debussy with an unbelievably expressive touch for such a young age (14); and Janice Meisner who performed The Gartan Mother’s Lullaby with her delightful flute. Finally, Sarah Rossy (about 18) gave a human voice to all the love and tenderness which had flown in the air for the past 90 minutes or so. She played and sang some of the jazz oldies (Bye Bye Blackbird, But Beautiful, and No More Blues). To share a sense of the warmth of the closing part of the concert brought by Sarah, I meant to share a music link here. I searched youtube for a performance of “Bye Bye Blackbird” as pleasant as Sarah improvised for us. And believe me you, I could not find any! The whole program was a thrill to watch and a treat to hear. More significantly perhaps was learning about the people who put so much love and effort into lending a helping hand to the less fortunate. We were told that the day brought another small sum of money (about $600) to the already raised funds of over a thousand dollar for hungry Haitian school children. Huge effort for a big cause by wonderful people. Supporting them is the very least one could do. What a great job, Booteh jan. I am a big believer in the more you give the more you get. Miracles will occur through volunteering, big ones and small ones, but all miracles. I have met the kindest and most generous people while volunteering. There is more satisfaction in giving something than receiving it in the long run. This is sing of a true giver. You’re an Angel Booteh jan ◠‿◠♥** Keep up your good work.